Limited Time Only: Score the Razer Phone 2 at HK$4,899. Score HK$1,900 off with your Razer Phone 2 purchase today. MADE FOR WORK. REFINED FOR PLAY. Industry-leading gaming performance meets premium flagship features—the Razer Phone 2 is the ultimate daily driver that smoothly handles your work, unleashes supreme mobile gaming power, and even lets you enjoy an unparalleled mobile entertainment experience. This time it comes with massive upgrades, featuring an upgraded processor with vapor chamber cooling, wireless charging, water resistance, and the long-awaited illuminated logo with Razer Chroma™. This is Flagship//Gaming. When it comes to mobile gaming, our UltraMotion™ technology reigns supreme. The Razer Phone is still the only smartphone with a true 120Hz screen, and that includes both touch sampling and display refresh rate. Break into your favorite mobile games at silky-smooth speed with no lag, complete with a response that’s accurate to the touch. Our 5.7” screen boasts a 120Hz 1440x2560 IGZO display, delivering an unrivaled standard in mobile gaming refresh rate. It’s now improved with a 50% brighter display and better color accuracy to take the Razer Phone to the next level. You can’t play hard without the hardware. We’ve engineered a cooling system that efficiently sustains higher average frame rates, for a cooler and more comfortable experience, whether you’re in an extended gaming session or running multiple apps at the same time. The Razer Phone 2 features a Snapdragon 845 2.8GHz processor, with a vapor-chamber cooling system that allows heat to spread throughout the phone via a custom vapor chamber which vastly increases the surface area for heat to dissipate, resulting in fewer hot spots. This allows greater performance and stability compared to traditional cooling methods. Create stunning photographs and video with the Razer Phone 2. Featuring dual lenses with dual Sony IMX Sensors and a wide lens with optical image stabilization. Capture picture-perfect moments with larger pixels and acute color accuracy, even in low light conditions. The front camera supports FHD video for sharp face cam footage while streaming or chatting. Built into our DNA, the Razer Phone 2 features an illuminated Razer logo with customizable Razer Chroma™ RGB lighting. Your mobile device becomes an extension of your character with 16.8 million color options, including personalized notification alerts. Use the CHROMA Configurator App to toggle between different colors, or select from three different lighting effects: static, breathing, and spectrum. Carry the power of Flagship//Gaming with you all day with an industry-leading 4000 mAh battery in the Razer Phone 2 that supports Qualcomm QuickCharge+. A Razer Chroma™ wireless charging base station features Wireless Fast Charging technology to get you to full power quickly so you’ll always stay in control for work and play. *Wireless charging base station available separately. The Razer Phone 2 is more robust than its predecessor. We’ve tested it up to IP67 so it stays protected when submersed up to 1 meter of water. Brave the outdoors and withstand the elements with a mobile phone that’s built to survive any weather. The Razer Phone 2 flexes its superiority in music and entertainment with Dolby Atmos dual front-firing stereo speakers. It supports both HDR and 5.1 surround sound content with an extended bass response. There’s no better way to watch your favorite shows and movies on Netflix while you’re on the go. We’ve included a high-fidelity USB Type-C DAC so 3.5mm headphone users can enjoy up to 24-bit audio. It doesn’t matter if you’re blasting your speakers or plugged-in to headphones—the Razer Phone 2 lets you enjoy immersive audio anywhere. 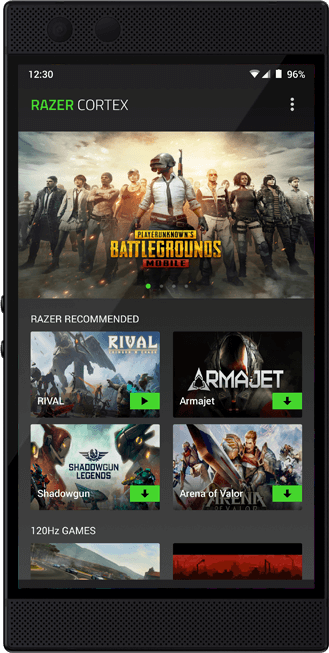 With the Razer Cortex Mobile app, you can discover a curated list of popular mobile games and utilize the Game Booster software for launching games and optimization. 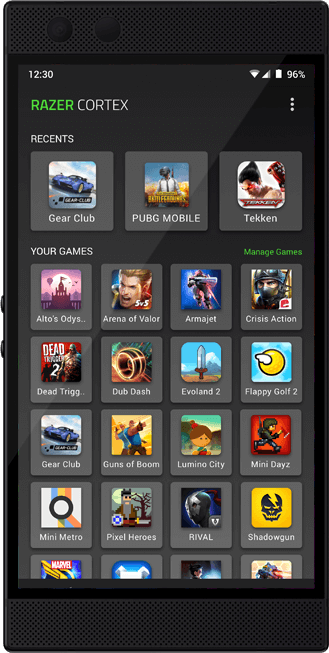 Tune performance for your mobile games and customize settings such as resolution, frame rate, and CPU clock speeds. The Razer Phone 2 is a true Android enthusiast mobile phone. The highly-acclaimed Nova Launcher Prime is pre-installed for free, bringing the most polished customizable Android launcher to the Razer Phone 2. Your phone becomes a true modern marvel, as you personalize every skin and setting to suit your everyday needs. 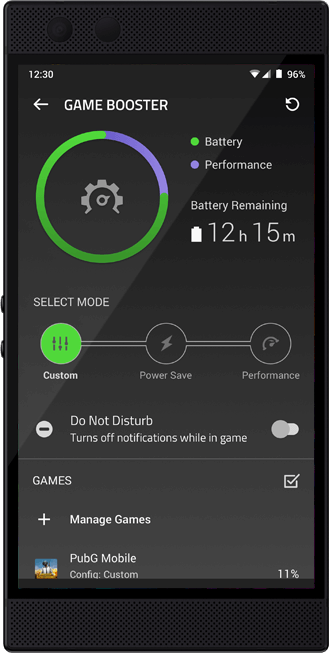 The Razer Phone 2 is part of the Razer Productivity Suite, which comprises of high performance products designed especially for professional use.